Fast installation and convenient to use. Folding design and easy to carry. Removable LED stripe and adjust it freely according to shooting demand. Limited discount: It is new arrival and there has an event. Limited to 100, with a 10% discount. The size of the light box is 24"x24"x24". The features of the shooting tent are high CRI, bright LED, no stroboscopic, multi-angle shooting and easy installation. Shooting Tent: The photography shooting tent is composed of the reflective fabric. The light lines emitted by the light beads are more evenly distributed in each corner of the photo studio under the effect of the reflective inner wall, so that the shed is brighter and the light is more uniform. The dimensions of the light box is 24''x24''x24''/60x60x60cm. 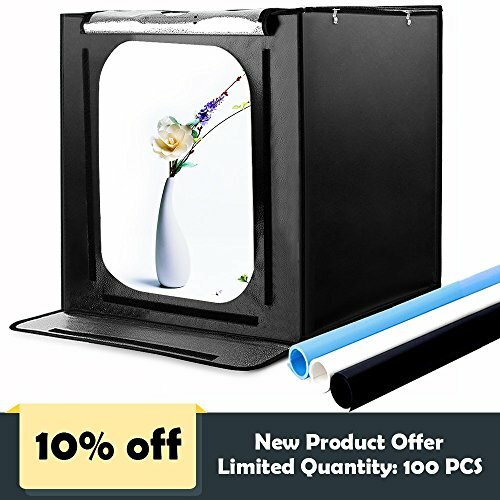 Multi-angle Shooting and Easy Installation: Front window and front hole support a horizontal shooting, a top hole supports a 90 degrees vertical shooting. You can shoot from different direction when using this photography tent. You can set it up quickly without any tool. It is lightweight, space-saving and resist compression, and easy to store and set up. Contents: 1 x Photo light box, 1 x Power adapter, 3x Background paper, 1 x Power cord, 1 x Manual. If you have any questions about this product by SAMTIAN, contact us by completing and submitting the form below. If you are looking for a specif part number, please include it with your message.